The New Recruits have Joined GSC! They’ll Be Running a Brand New Project! The GSC Offices, June 6th 2012! We have so many more comrades nowadays!! This year we have 8 new recruits! These are the 8 new recruits of Good Smile Company! Of the eight, two are joining the production team as novice sculptors, and the other six are on job rotation, working with all the divisions and learning in the process! A product to display figures more ideally! Oooh! That sounds pretty cool!! I guess I’ll have to wait and see – but perhaps I’ll be able to display my figures in a more interesting way soon! They’re also starting up a new blog!! I’m sure there will be a number of stepping stones for us along the way, but I hope the blog will be an interesting read! There will also be more detailed staff introductions on the new blog! The newcomers have an interesting first year, and I hope everyone will be there to support them! Here is the address once again! The blog is aiming to be updated every weekday! Win a Chance to Purchase figma Giant Warrior and Early Entrance Tickets to Anno Hideaki’s Special Effects Museum! Yesterday it was announced that before Anno Hideaki’s Special Effects Museum opens to the public on the 10th July, there will be a special 10000 person invite-only opening taking place from the 6th July (Fri) to the 8th July (Sun). Good Smile Company will be offering a chance for 1500 people to purchase tickets to the invite only event taking place on the 6th July. Those who purchase these tickets will also receive figma Giant Warrior, which is based on the short film that will be shown at the event, ‘A Giant Warrior Descends on Tokyo’. ・ From the 6th July to the 8th July there will be an early invite only event for 10000 people! ・ You are purchasing a set with both figma Giant Warrior and tickets to the event on 6th July! ・ The price for the set is 3500JPY! Great value! ・ 1500 sets will be sold. If over 1500 people apply, winners will be selected by raffle. Dàjiā hǎo (Hello everyone! 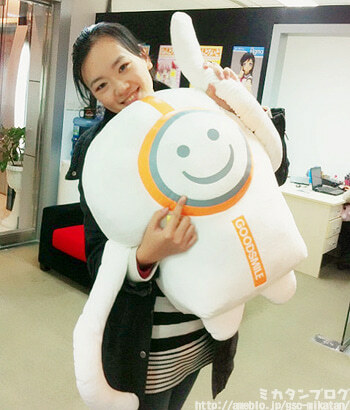 ), it’s Suzuki from Good Smile Shanghai! From today for the next three days, I’ll be introducing some of the staff here at Good Smile Shanghai, along with some comments from them! First up we have GSC Shangai’s only female staff member, Ryuu-san! She is involved in lots of things, from management and office work to translation! Once when I was feeling down in my college years, one of my lecturers taught me the proverb, ‘A smile a day will bring happiness your way’. Ever since then, I’ve been determined to get through each and every day with a smile across my face! I was born in Shangai, but I’ve got a terrible sense of direction, and I’m not very familiar with the tourist attractions around here. If you ever visit Shangai, I hope you’ll visit both the bustling cities as well as the more rural areas and experience the joy that lies here in Shanghai, growing more and more everyday. Ryuu-san really goes through each and everyday with a lovely smile! I’ll be continuing the staff interviews tomorrow! She looks like an idol in that photo! I just want to hug her!!! The real version is just as cute!